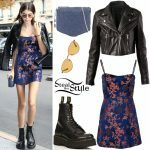 Karrueche Tran was spotted leaving Fred Segal after lunch with a friend at Mauro’s Cafe wearing the Paisley Sports Bra ($14.00) and Luna Leggings ($20.00) both by Young & Reckless, a Givenchy Antigona Mini Leather Bag ($1,790.00) and Yeezy Boost 350 V2 Sneakers ($835.00). 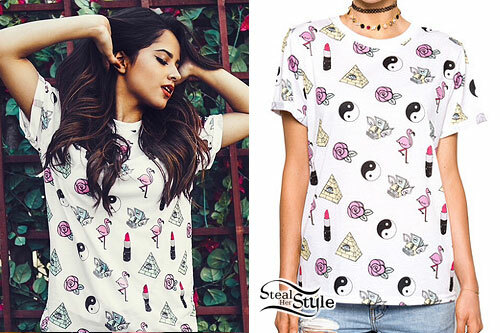 Becky G posted an instagram photo from a photoshoot with Young & Reckless wearing their Girls Just Wanna Have Fun White BF Tee ($32.00) from the brand’s collaboration with illustrator Valfre. Jasmine Villegas posted a new instagram photo tonight wearing a Young & Reckless ASAP Ferg YR Women’s Sports Bra ($27.99) with a pair of Pink Dolphin Script Sweatpants In Oatmeal ($85.00). Jasmine Villegas posted an instagram photo wearing a Petals and Peacocks My Bad Crop Tee ($34.00), Young & Reckless Untouched Red Fleece Sweatpants ($49.50), and all-black Nikes similar to the Air Max 1 Essential Sneakers ($100.00). 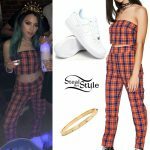 Jasmine Villegas wears an American Apparel Women’s Long Sleeve Cotton Spandex Jersey Crop Top ($28.00), Young & Reckless 86 Bonnie No Clyde Sweatpants ($49.50), and a pair of Nike Air Max Thea Women’s Shoes ($89.99) in White/Hyper Pink/Cool Grey/Black. 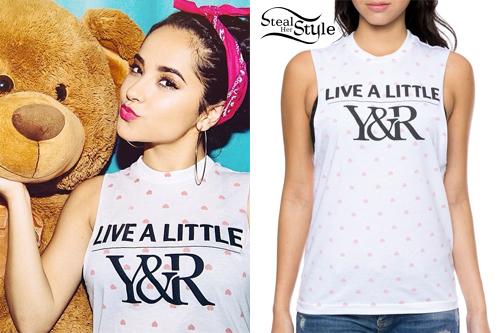 Becky G did a new photoshoot for Young & Reckless wearing their Live A Little Women’s Muscle Tank ($28.00). This white tee is covered in a print of pink upside-down hearts. 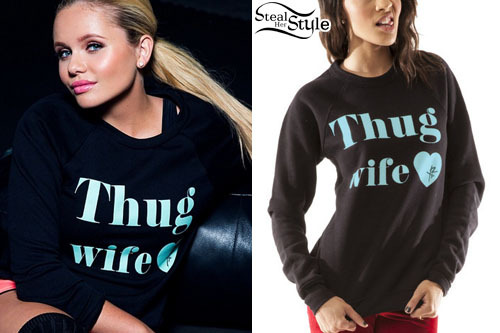 Alli Simpson posted this photo on instagram today wearing a Young & Reckless Thug Wife Sweatshirt ($52.00). 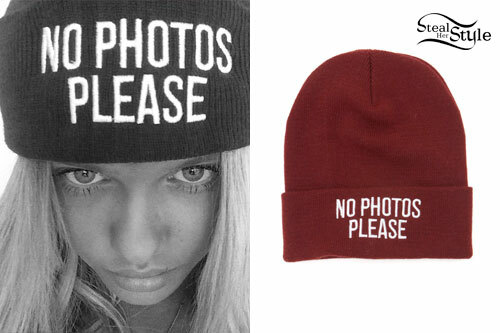 Alli Simpson posted a new instagram photo today wearing a Young & Reckless No Photos Beanie ($20.95). 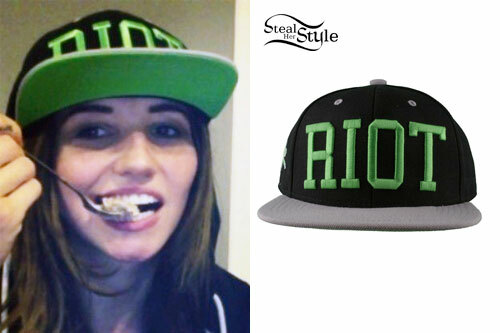 LIGHTS posted a new instagram photo today wearing a green, black and gray Young & Reckless Riot Hat ($26.45). 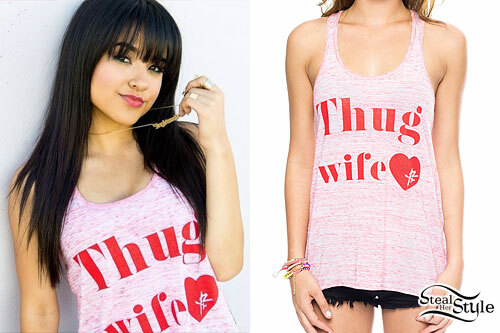 Becky G posed for Young & Reckless wearing their Thug Wife Red Marble Flowy Racerback Tank Top ($26.50).